I've been on the hunt for really hydrating hair care products lately, since my hair has been feeling a bit drier than usual. It might be due to the change in seasons, but whatever the reasoning, I desperately want to re-hydrate my hair! 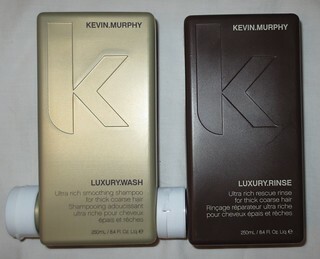 I've been turning to KEVIN.MURPHY's LUXURY.WASH & RINSE* ($27.50 CAD each) to help add some hydrating back into my locks. "The reinvented LUXURY.WASH is an ultra rich shampoo with ingredients specifically suited for the needs of thick, coarse hair. Mango Butter and Shea Butter have excellent moisturizing properties to counteract the effects of permanent colour and chemical damage. This shampoo is designed to give the hair more flexibility and to make the hair that is normally course be more supple and manageable. This shampoo is especially good for curly hair as it has the right hydro lipid balance that suits the needs of curly hair. Buriti Nut Oil, a natural source of Vitamin A, gives the hair elasticity and shine. For thick, coarse hair. Sulphate and paraben free. suited for the needs of thick, coarse hair. This conditioner has the ability to make the hair more supple and improves flexibility on hair that is naturally course. 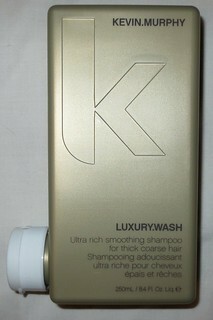 KEVIN.MURPHY's LUXURY.WASH is a very hydrating shampoo that lathers up incredibly well. You only need the tiniest amount of this shampoo to create a nice lather. So, even though the bottle looks very small (holding 250ml), the bottle should last you a while. I really love the packing of these products, I think it's really cute! I love that this shampoo really does add a jolt of moisture into my hair, instead of just completely stripping out the oils like some shampoos tend to do. This line also has the most amazing scent to it, I think it's a mix between something citrusy and a warm vanilla. I can't quite place my finger on what it is exactly, but I do know that I love it! 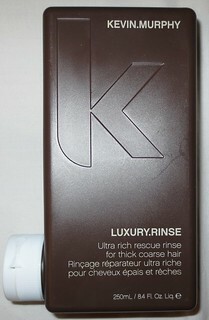 KEVIN.MURPHY's LUXURY.RINSE is a fairly thick conditioner. I like to leave this on my hair for about 3-5 minutes and then rinse it out. This conditioner has the same lovely scent as the shampoo, but unfortunately I don't find that the scent lingers in my hair for too long. This conditioner really hydrates my hair, so that it feels super soft. This product also helps to reduce frizz, and it adds a healthy dose of shine. I have naturally wavy/curly hair, and this thick conditioner doesn't weigh down my hair at all. This sounds great! My hair gets a lot drier in the winter so I'll have to pick this up!